Live Three Card Poker from Evolution Gaming is one of the best variants of Poker. The game is designed to offer players with quality and thrilling playing experience across different platforms. Three Card Poker is one of the best specialty table casino games that comes with multiplayer scalabilities and Direct Game Launch. Some of the reasons why Three Card Poker has become so popular are; it is easy to play, has fast-paced and fun gameplay, and with a low house edge of between 2% and 4%. This game is available at several reputable UK based online casinos such like bCasino and others. All bCasino live dealer games are played in real time and streamed live in HD quality. Players can choose to play on their mobile devices as well as on the desktop. Some professional dealers are friendly and ready to answer all the questions you may have. bCasino is one of the leading UK online casino sites. Despite being a newcomer, they have made a name for listing games from giant software developers in the igaming market - Evolution Gaming included. Evolution Gaming has been producing live dealer games for many recognizable casino operators for over a decade. The latter pride in having one of the biggest game libraries of live dealer games in the market among other RNG brands. Besides, the site is licensed and regulated by the UK Gambling Commission and protected by Secure Socket Layer (SSL). The casino boasts rewarding their new players with a generous welcome bonus of 100 free spins after $1200 bonus. There are additional promotional offers like reload bonus, match bonus, cashback bonus, and loyalty bonuses. You will be able to withdraw and deposit your funds via widely accepted options such as Mastercard, Skrill, ecoPayz, Instant Banking, and Pay by Mobile. As mentioned above, Three Card Poker is high quality and interactive multiplayer games for players with all levels of skills. With numerous chances to win, the game has received a considerable fun follow up across the UK and far beyond. The reason for its fast growth is simple. The game combines all the thrill and fun into small hands of three cards. It has been simplified for novices as well as poker lovers. Three Card Poker live is played on a single deck of cards and offers gamers unlimited wagering possibilities and of course, huge payouts. The goal in this game is to beat the dealer with a hand of three cards. The player places an ante wager and follows it up with a similar gaming bet. All players I the gameplay against the dealer, who must have at least a Queen to qualify. Players who manage to achieve a Straight Bonus or better are rewarded with an Ante Bonus, regardless of the dealer's hand. Additionally, the optional Pair Plus and Six Card special bonuses provide punters with the opportunity to win extra huge payouts of up to 1000:1 regardless of the hand. It is important to note that the game is played with 52 -cards which are shuffled after every round. So, if you are on the hunt for some real action and the opportunity to earn some extra money, Three Card Poker is the best choice. There are two main types of bets you can place in Three Card Poker: ante bet and pair plus. You can choose to be on one of them or both. The Ante bet is placed against the dealer while the pair plus does not depend on the dealer's hand. The pair plus bet will lose if you have less than a pair and win if it is better. After the cards are dealt, a player can choose to bet again or fold. By folding, it means the dealer has opted out of the game. 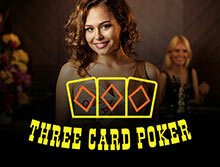 Three cards are dealt with each player playing the ante bet and three cards to the dealer. The player must then decide to play bet or fold after viwing the cards. Here is a showdown of the decisions to be made after the dealer's hand is revealed. The Ante bet pays even money, and the players bet returned if the dealer does not have Queen High or better. If the dealer has a queen high or better and is beaten by the player's hand both the ante bet and the play bet are returned. If the Dealer has queen high or better and the dealer and the player's hands are equal the player's ante and play bets are returned. If the dealer has a queen high or better and the player's hand happens to be worse than the dealer's then the ante and play bets are lost. The six card bonus bet is an interesting side bet where the payouts depend on the best poker hands from six cards. This is a combination of the dealer and the players, and it usually pays out on three of a kind or better. Fast-Paced gameplay and high-quality sound output. The game is optimised to be played on devices with different screen sizes. 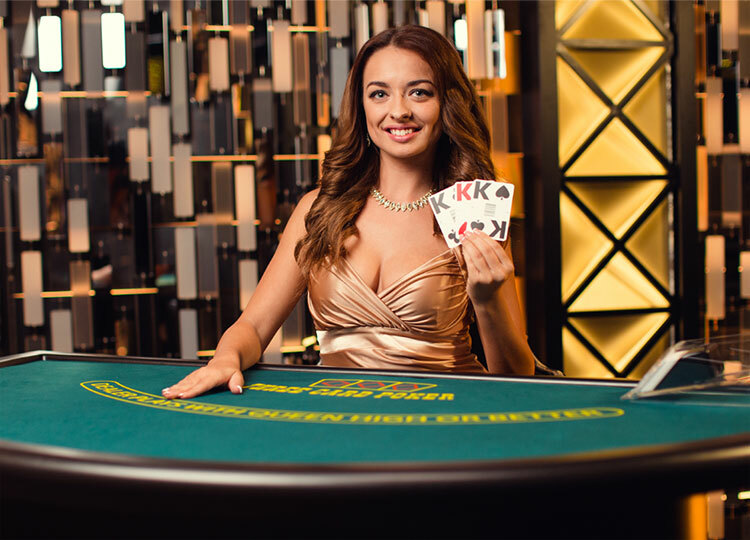 Players enjoy a variety of bets such as the ante bonus, pair plus, and six card bonus. The game rules are easy to understand for beginners and experienced gamers. Maintains the thrill and fun of a real brick and mortar casino. The live version takes slightly more time to play compared to the RNG variation. The live version of Three Card Poker is proving to be the best variation of the game at most UK online casinos including bCasino. Players who choose this operator are entitled to several lucrative bonuses and promotional offers to help them to build their bankroll. Moreover, bCasino has a qualified customer support team which works 24 hours 7 days to ensure that all players' questions are attended.